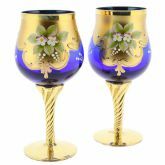 Elegant and stunning, this set of two Murano Glass Wine Glasses comes from the famed glassmaking workshops of Murano Island and represents the opulence and finesse that brought worldwide recognition to generations of Murano Glass artisans. 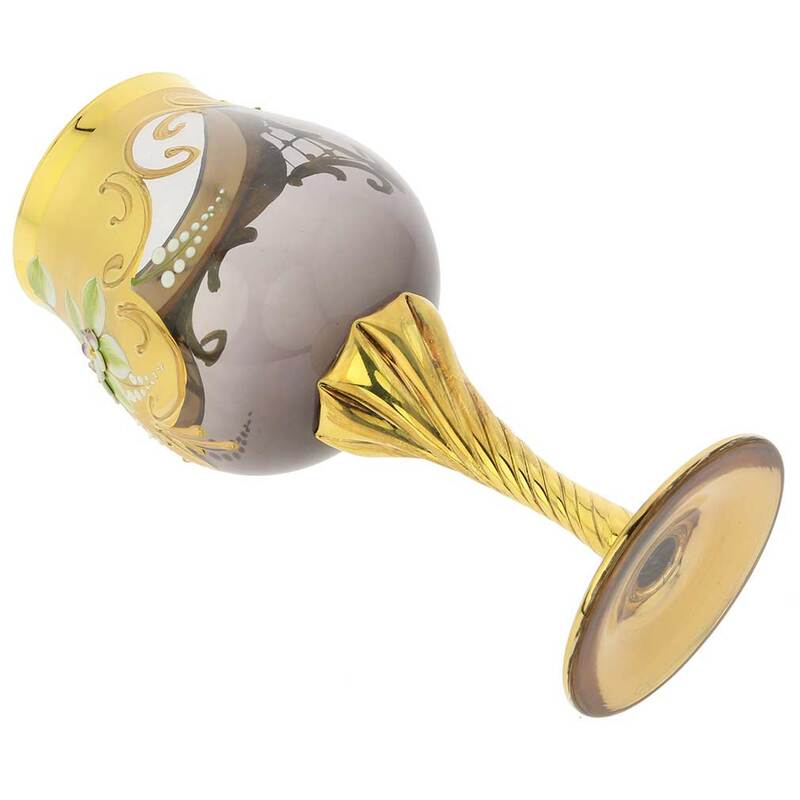 The decorative technique used to craft these wine glasses is called "Tre Fuochi" or "Three Flames" and was developed during Renaissance, when wealth and glory of Venice attracted the best masters and craftsmen who created the most luxurious articles one could imagine. 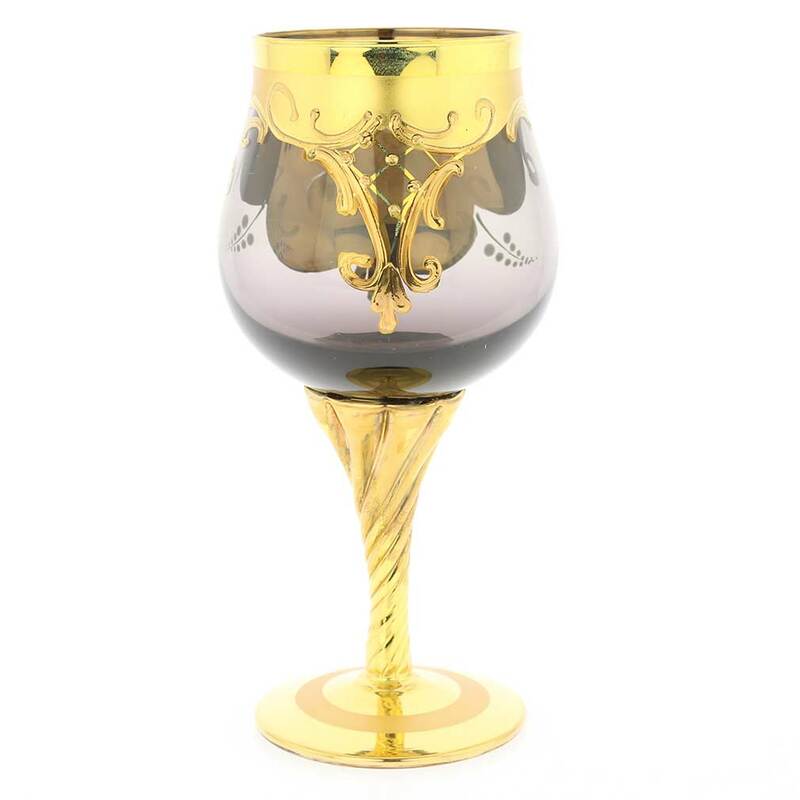 Amid the hunt for refined elegance, this type of light and rich glassware decorated with real gold struck just the right chord with wealthy and stylish Venetians. 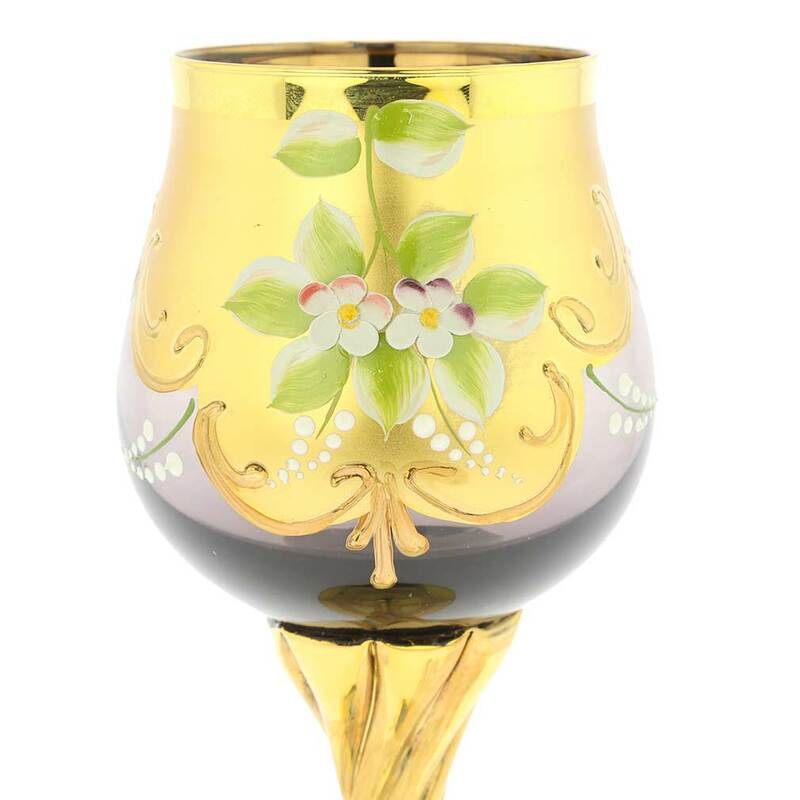 To create each of these wine glasses, artisans first blow and shape molten glass, then apply rich decoration of 24K gold leaf and enamel in a complex multi-stage process, which requires precision, experience, and rare skill. 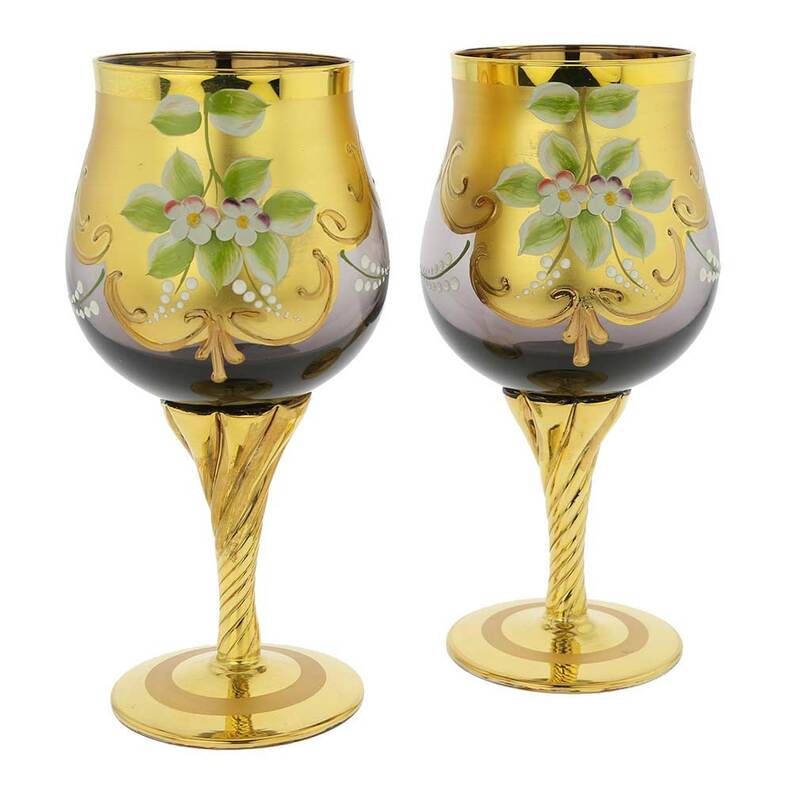 These fine wine glasses from bring to life the glamour of the bygone era and let you enjoy old-world European style. 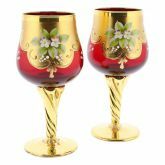 This Venetian wine glass set is a great unique gift for special occasions such as weddings or anniversaries. 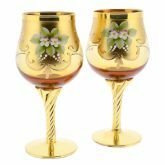 Measurements: This Murano Glass Wine Set includes two amethyst-and-gold wine glasses. Each glass measures 7 inch in height, and the diameter of the base is 2-1/2 inches. The diameter in the widest part of the glass is 3-1/4 inches. 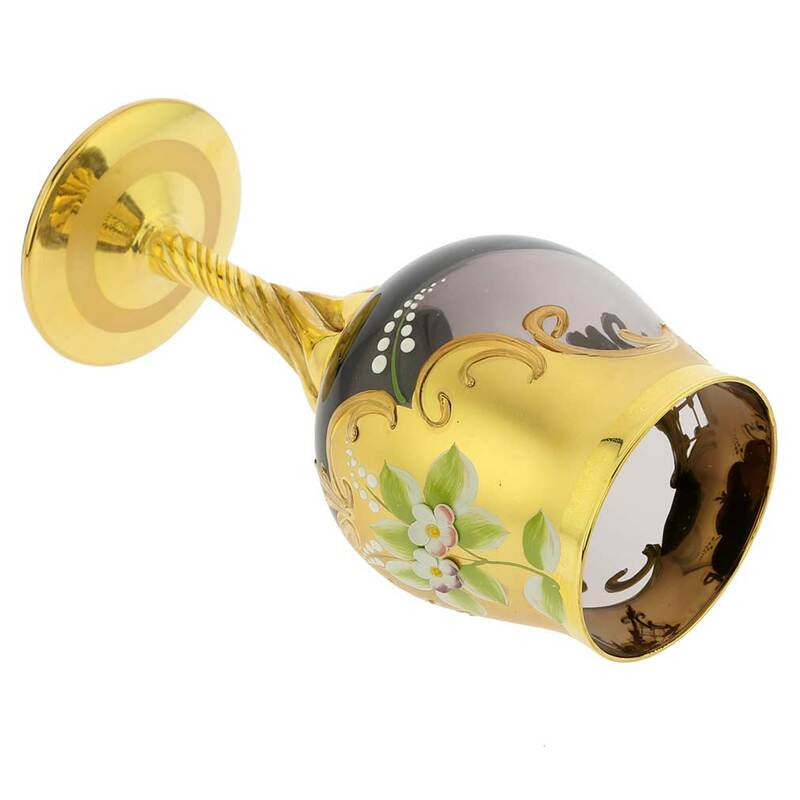 These gold wine goblets are hand-blown and hand-decorated using real 24K gold. 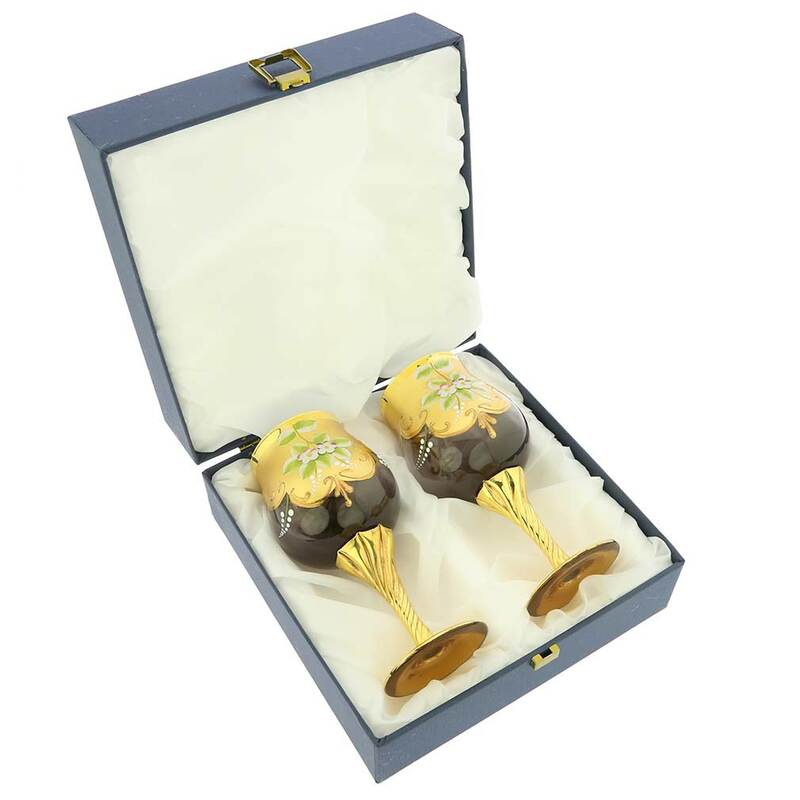 They are attractively presented in a blue gift box lined with silky white fabric that not only looks great but also assures safe transit to the recipient. The set comes with a certificate of authenticity. These glasses are absolutely gorgeous! I bought a matching set of wine decanter and six small toasting glasses last year when I was in Venice, Italy! These 4 glasses round out my set perfectly!